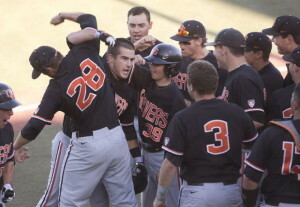 Following a 6-2 loss to Kansas State in game one of the Corvallis Super Regional on Saturday, Oregon State bounced back with a 12-4 rout of the Wildcats in game two, evening the series for Monday night’s elimination game. Oregon State came out swinging, scoring five runs in the first inning. Michael Conforto and Dylan Davis led the charge with solo home runs, followed by a Ryan Barnes RBI single and a Jake Rodriguez two-run single. The Beavers would add two more runs in the second on a two-run single by Dylan Davis. The Wildcats would respond with a solo homer by Jared King in the second and a pair of sacrifice flies in the fourth, however, it would not be enough as the Beavers would tack on three more runs, taking a 12-3 lead into the bottom of the ninth inning. A Mitch Meyer fielder’s choice would score Clayton Dairymple in the bottom of the ninth, but Oregon State reliever Scott Schultz would bounce back by closing out the game and cementing the series tying victory for the Beavers. Oregon State starter Andrew Moore earned his 14th victory of the season, working eight solid innings and surrendering four runs (three earned), while striking out nine batters and walking three. Both teams will seek advancement to the College World Series with a win on Monday (10:00 PM), as the Wildcats attempt to reach their first College World Series appearance in school history, while the Beavers look to capture their third NCAA title (and first since going back-to-back in 2006 and 2007).